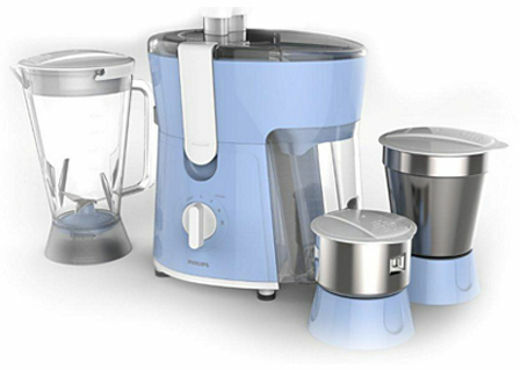 The Philips HL7576-00 juicer mixer Grinder offers a single stop solution to your daily kitchen chores. This device comes with a powerful 600 W Torque X motor which ensures perfect grinding, juicing and mixing to give the preparation the right consistency. Specialized blades with short arms ensure cutting of even the smallest of foods. This device is strong and offers food safety. The mixer has plastic body parts that are clean and do not harm the food. The jars are made of rust-free stainless steel which prevents rust from spreading along the mixers surface. This protects your mixer and your food. It also comes with an Auto cut-off protection which protects the motor and increases its working life. This device makes juicing, mixing and grinding a less cumbersome task. It is equipped with useful accessories which include a detachable spout and pulp container. The spout ensures that every drop of juice drains from the jar. This detachable spout also ensures easy cleaning of the device. The pulp container discards the pulp without having to switch the motor off. This ensures that you don't keep switching it off to check the readiness and can make as much pulp as needed without any hitch.